The race to replace U.S. Rep. Beto O'Rourke is turning into a border brawl where hardly any punches are being pulled. EL PASO — The first question at a recent forum in this Democratic stronghold should have been an easy lay-up for the candidates vying to represent El Paso in Washington next year. The moderator asked about immigration, and all of the candidates agreed that young undocumented immigrants, known as "Dreamers," should benefit from a legislative fix that protects them from deportation. 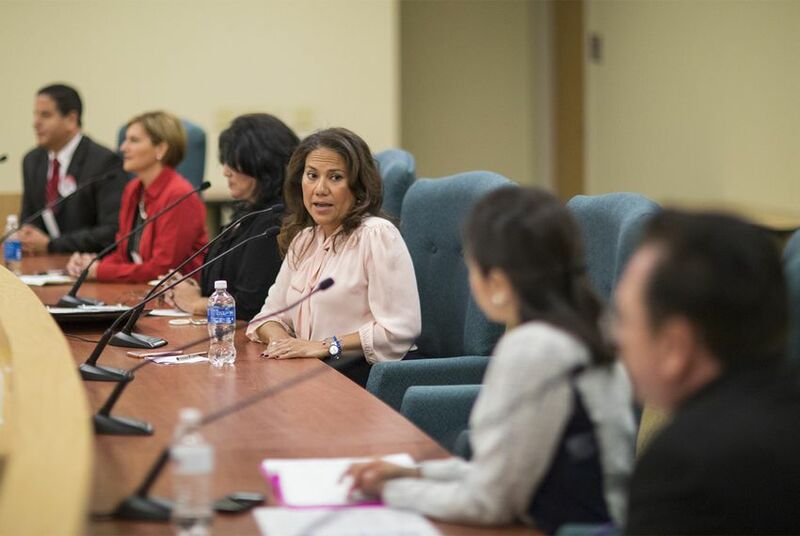 But less than a minute into giving her opinion that congressional Democrats had turned their backs on Dreamers last week when they voted to fund the government without an immigration fix, former El Paso County Judge Veronica Escobar was interrupted by a heckler. “Tell that to your husband!” a woman shouted. Escobar paused for a second, then asked the audience to refrain from jeering and remain polite. The debate continued, but the outburst was just one example of the bad blood that has permeated throughout the campaign to replace U.S. Rep. Beto O'Rourke, who is leaving his Congressional District 16 seat in an effort to oust U.S. Sen. Ted Cruz, R-Texas. Escobar is one of six Democrats hoping to succeed O’Rourke. The others include former El Paso Independent School Board of Trustees President Dori Fenenbock, former longtime Texas House Rep. Norma Chávez, immigration attorney Enrique Garcia, Army veteran and school teacher Jerome Tilghman and University of Texas at El Paso lecturer and Communications Director John R. Carrillo. Two Republicans are also running. Escobar and Fenenbock are winning the money race and have hauled in some key endorsements. But Chávez is banking on her name ID and experience in the state house to help her pull an upset. Garcia is branding himself an independent who’s the perfect antidote to Trump because like the president, Garcia said, he’s not a career politician. Tilghman is fighting an uphill and underfunded campaign by sticking to the issues and leaving personal attacks off the table. Carrillo was absent during last week’s forum, and his campaign didn’t respond to an email seeking comment about the race. Escobar is running, in part, on her experience as a former leader of a county government that fought corruption and is touting how her progressive ideals helped shape policy. Escobar voted to sue the state after the Legislature passed Senate Bill 4, the state’s anti-“sanctuary city” law, and she’s been an outspoken advocate for the LGBT community. But the issue of her husband, Michael Pleters, and his job as a federal immigration judge, is one her opponents are latching onto tightly. Fenenbock, who describes herself as the moderate in the race and who’s been dinged on the campaign trail for garnering financial support from Republicans, is quick to highlight what she says is the hypocrisy of Escobar’s campaign. The pack of candidates hopes that Fenenbock’s embrace of the term “moderate” proves to be her Achilles' heel. The Escobar campaign points to a July story in the El Paso Times that shows Fenenbock received almost half of her initial financial support from El Pasoans who voted in the 2016 GOP primary. She also voted in the GOP primary in 2008 and 2010. When asked if voters could see O’Rourke’s support for her and Reyes’ support for Fenenbock as a throwback to old El Paso grudges, Escobar said she’s not hearing that from voters. Meanwhile, Chávez, who served seven terms in the Texas House until her defeat in 2010, is campaigning on that experience to try to differentiate herself. Chávez recently touted her past relationships with current U.S. House members Henry Cuellar, D-Laredo, and her former Austin deskmate Joaquin Castro, D-San Antonio. Chávez also recently announced a campaign event with civil rights icon Dolores Huerta, who will rally with Chávez next week. Though he’s outfunded and doesn’t have the name recognition, Tilghman isn’t backing down. At a campaign event on Monday, the Gulf War veteran and former field grade officer said the race isn’t about money. He said Escobar’s husband isn’t an issue for him and compared the judge's job to his former role as a soldier. It’s that line of thinking that he says makes him different. Tilghman said he approaches issues from a policy perspective, which is what’s missing from the campaign.